Al Ahli Hospital officials receiving the award for achieving international healthcare re-accreditation. 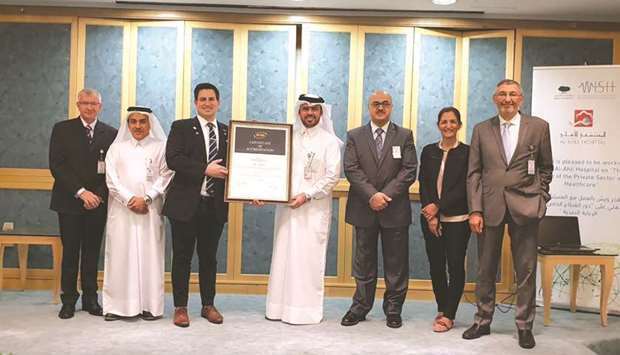 Al Ahli Hospital has been awarded four years’ full healthcare re-accreditation by the Australian Council on Healthcare Standards International (ACHSI). This marks the four years since the hospital first achieved full international accreditation under the ACHSI Evaluation and Quality Improvement Programme. The accreditation evaluation was conducted by peers from Australia, Hong Kong and India who evaluated full compliance with 46 demanding standards and extensive evidence of continuous quality improvement activities across all aspects of the Hospital’s operations. The team were also satisfied that the recommendations made during the previous accreditation cycle has been fully implemented. The survey team, led by Vincent Gaglioti congratulated the hospital on it measureable improvements across all evaluation areas and on the significant enhancements implemented in team collaboration and focus on improving the quality of care. Dr Khalid al-Emadi, chief executive officer of Al Ahli Hospital, welcomed the opportunity for an in-depth peer review and feedback and acknowledged the commitment demonstrated by all staff to strive for the highest international standards of care and quality. He said: “Achieving ACHSI accreditation originally was a significant boost to the team and this helped propel them to higher levels of achievement. Sustaining and improving this standard over the longer-term is very gratifying and underscores the hospital’s mission and values”. Jamal Hammad, deputy chief executive officer, said: “The hospital is eager to achieve and excel in international standards for patients safety and we are doing our best to achieve the highest quality in healthcare for patients by enhancing education and professional development for medical, nursing and allied health professionals. This creates an entrepreneurial spirit among them as they strive for best possible practice”. “Al Ahli Hospital is characterised by professional medical and nursing staff who are dedicated and the proof of this is the strong communication between them which demonstrates a dynamic team focused on patient safety and excellent clinical outcomes. This has been part of the longer-term strategy to provide excellent service and the best quality of care,” Dr Abdul Azim Abdul Wahab Hussain, medical director, noted.